A desire to show how much we care fuels our search for the perfect holiday gifts each year, yet few store-bought items are as heartfelt as handcrafted, personalized gifts. 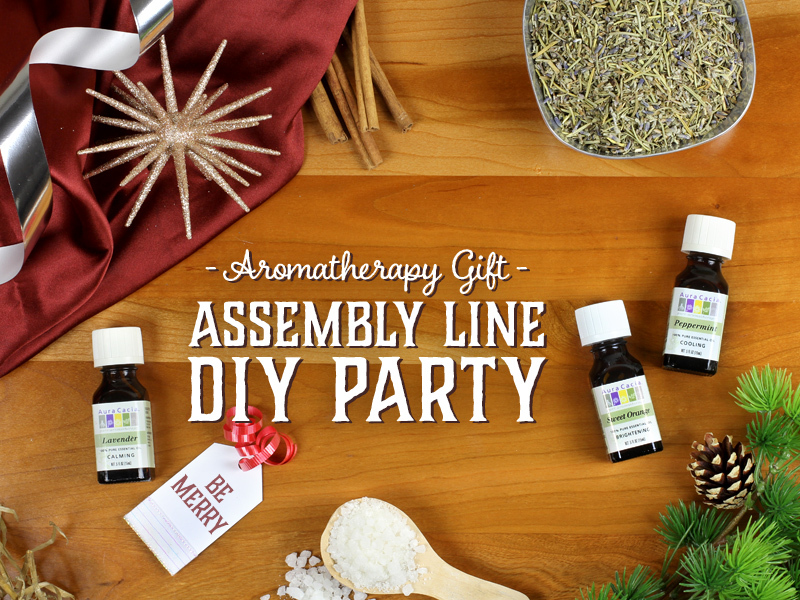 This year, choose conviviality rather than a mad rush to the mall by hosting an aromatherapy gift assembly line DIY party with your family or a group of friends. 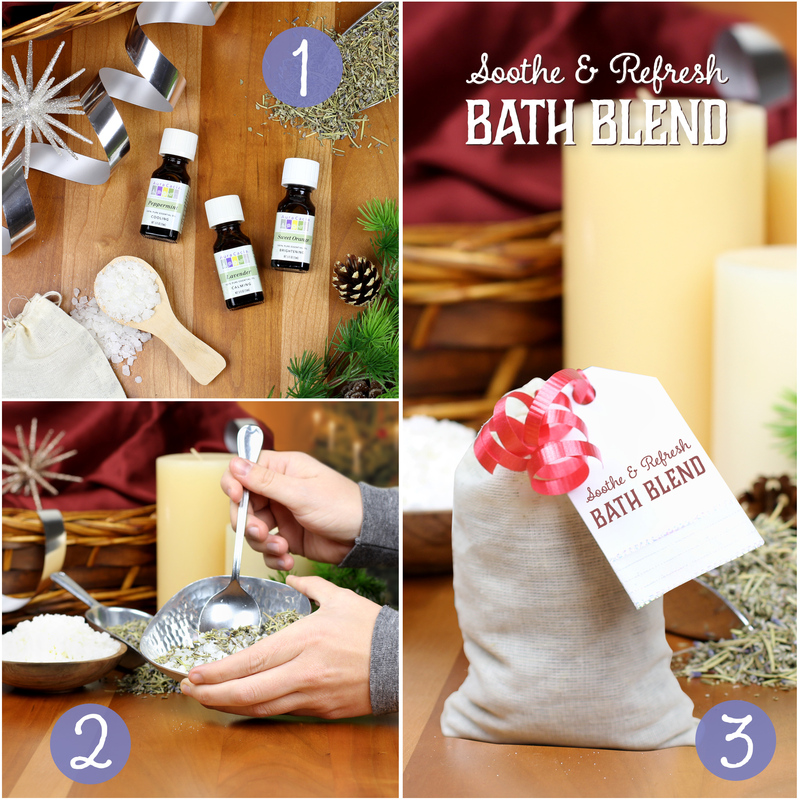 This set of Soothing and Refreshing aromatherapy gifts — including a homemade bath salt blend, a body oil and a hydrating aromatherapy mist — are both nice to receive and fun to make! Step 2: Create a festive atmosphere. This is a party, after all! Prepare some snacks and drinks, turn on your Christmas lights and play a selection of your favorite Christmas tunes. 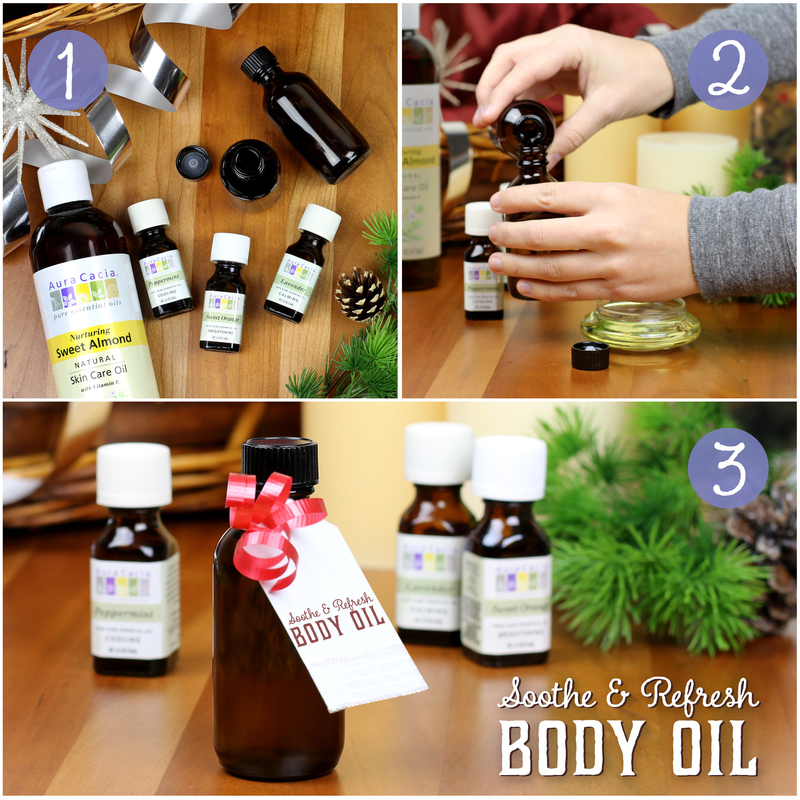 Step 3: Make your Soothe & Refresh Essential Oil Blend. You’ll use this blend for your three different gift recipes. Directions: Combine all oils in a 2 oz. amber glass bottle. Shake gently, and use blend in the following recipes. Step 4: Set up your assembly lines. 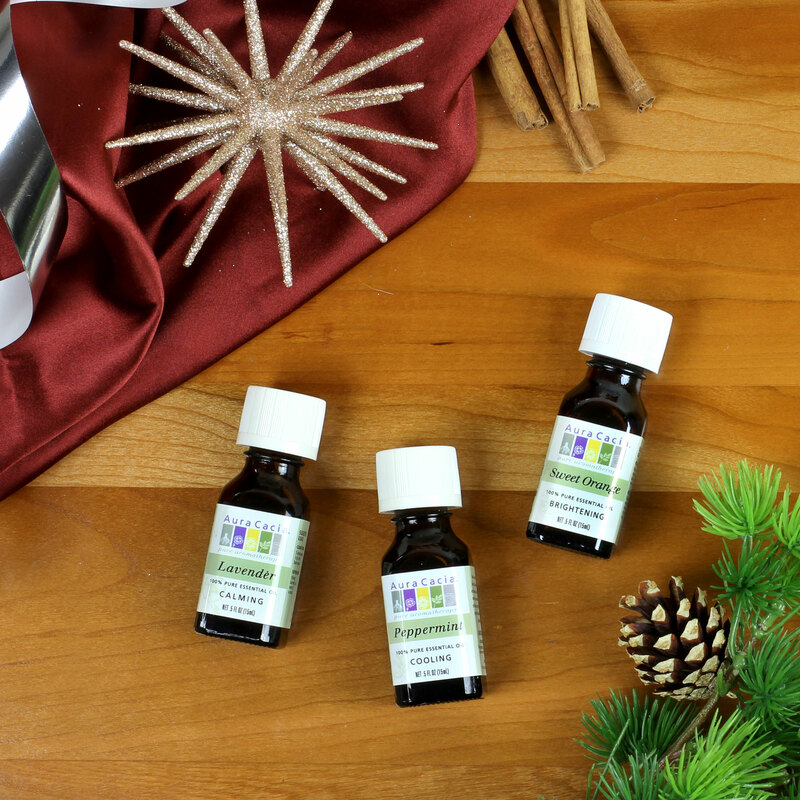 Set out your materials for each of the gifts, including one bottle of the Soothe & Refresh Essential Oil Blend at each station. Include gift tags, string or ribbon, and pens for personalization and decorating! These little bags of bliss can be steeped in a warm bath to create a soothing and refreshing at home spa experience. Directions: Measure and toss salts and herbal blend in a bowl, sprinkle with oil blend and toss thoroughly until well-combined. Fill drawstring bag with mixture and package in a cellophane bag, airtight tin or jar. This silky oil can be used in the bath or as an after shower moisture-supporting body oil. Directions: Measure sweet almond oil and Soothe & Refresh essential oil blend into a measuring cup. Stir until well combined and decant into amber bottle. This simple water-based mist provides a refreshing boost when applied lightly to face and neck. 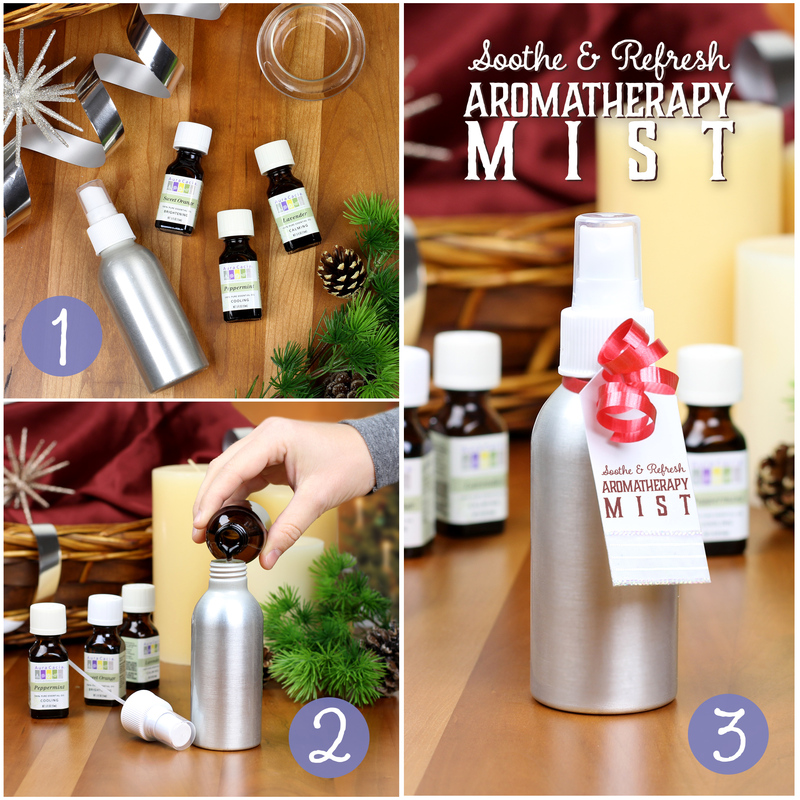 Directions: Measure water and essential oil blend into mist bottle cap and shake well before each application. What homemade gifts are you giving this year? Share your ideas below! 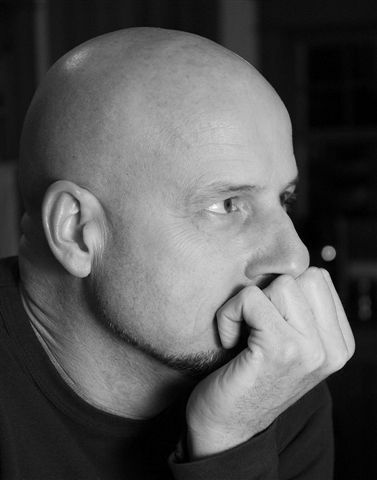 I am having people make their own so they can customize their own blends based on their preferences.